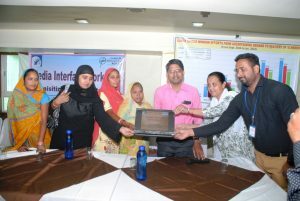 A Helpline, which will operate from the Sahaya Single Window in Ajmer, was launched by Dr. Abhishek Gupta, District Social Welfare Officer, for the effective implementation of schemes that are being implemented by the Government of Rajasthan’s Department of Social Justice and Empowerment, under Palanhar. The launch which was held yesterday (March 28, 2018) during a media interface event was attended by five (5) representatives from the print and electronic media, 45 community representatives, social security scheme messengers, members of the CBO Akshara and representatives of 12 settlements. The decision to launch the Single Window was taken following demands by community representatives that information and counseling on Palanhar schemes be provided on a daily basis. The Helpline will therefore be providing information regarding all schemes to both urban and rural people through its Helpline number. this model was successful the Department would share this initiative with Directorate at the state level so that it could be replicated in other districts. Seven beneficiaries of Palanhar then spoke of how they had successfully accessed schemes through the Single Window. Sanjay, a resident of Sansi basti who had lost both his eyes 25 years ago said, “I gave money to a broker and waited for three years to get the benefits of Palanhar. It was only after Vidhya, a community representative, submitted my application and did continuous follow ups that I started getting the benefits”. Others like Pinki, Nirmala, Krishna, Puja and Jamuna also shared their experiences of accessing Palanhar schemes; under which beneficiaries gets Rs.500 for 0-6 year old children and Rs.1000 for each child per month. In addition to this Rs. 2000 is given annually to each child for purchasing school bags, clothes and shoes. To date 1126 beneficiaries have availed the benefit of Palanhar schemes through the Single Window.